There is a spiritual dimension to every relationship, no matter what its origins, whether it is acknowledged as spiritual or not. Two people come together because spirit wants them together. Marriage is a rite of passage. It is a severance of what your relationship has been, and a crossing of a threshold into a new depth of intimacy and commitment. Honor the magnitude of this incredible transition. Choose to cross this threshold consciously. 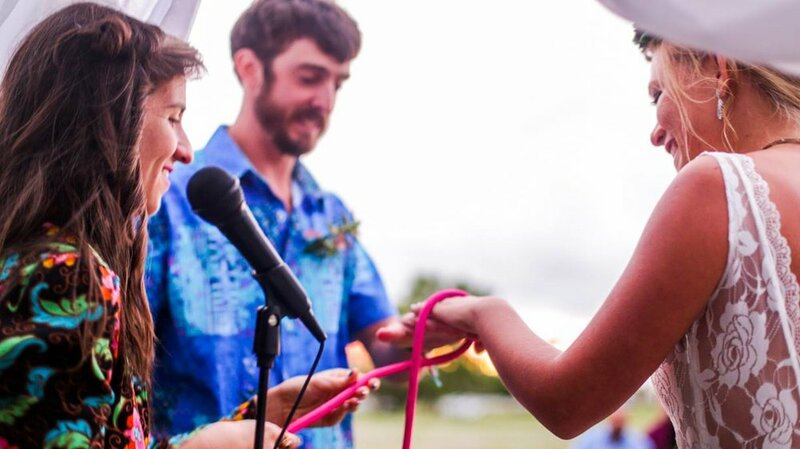 Co-create a ceremony that captures the essence of your partnership and evokes community participation. Relationships are incubators for growth. Ruptures in relationship are natural and necessary for the evolution of the partnership and each individual. Each breakdown is an opportunity to breakthrough to a new level of loving one another, and loving yourself. We don’t have to move through challenges in our partnerships alone. Rituals of repair create containers to sit with relational shadows, ask spirit for support, and call upon the wisdom of the couple to transmute the stuck into the sacred. Did you know it’s actually possible to let go with love and grace? Leaving in anger is certainly easier. However, it ultimately doesn’t serve us. Ceremonies of separation create a structure that promote healing and closure. Choose to let go with love and bless your beloved in a divine departure. “Elizabeth was completely indispensable on my big day. She lent an air of ceremony and helped me to center myself amidst the chaos. She helped me to step outside of myself and be truly present, while honoring the power of ceremony and the vows that were taken. We started my wedding day with bridal yoga led by Elizabeth in the presence of my bridesmaids, which provided much-needed stillness and relaxation.